We all know that borrowing any amount of money through any type of lending product puts us into debt. There really isn’t any way around it. Typically, debt is considered a “bad thing”, and we definitely agree with this, but that doesn’t mean that all debt is bad. Just like with most financial matters, deciding whether taking on debt is a good idea or a bad idea should be done on a case by case basis. There is almost always a responsible way to borrow money, no matter what your financial situation is and no matter what type of loan you’re interested in. 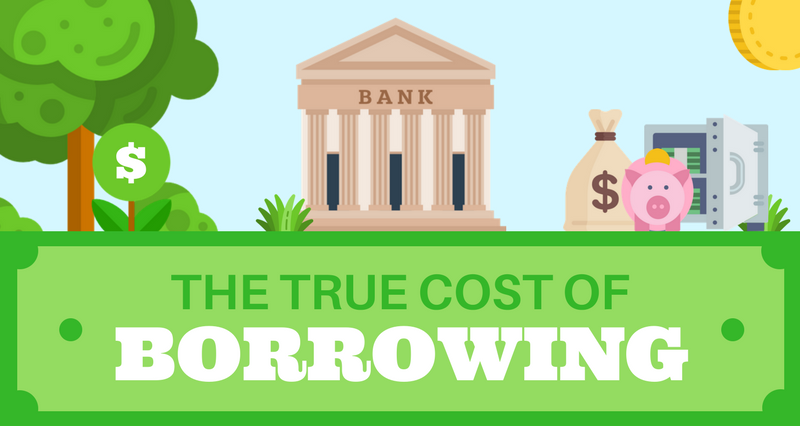 One of the best ways you can figure this out is by taking into consideration the true cost of borrowing. Borrowing money, whether it’s a mortgage or through a credit card, will cost you the amount you borrowed plus interest. This is a very basic description of being in debt, something that everyone knows and more than likely considers before they decide to be a borrower. 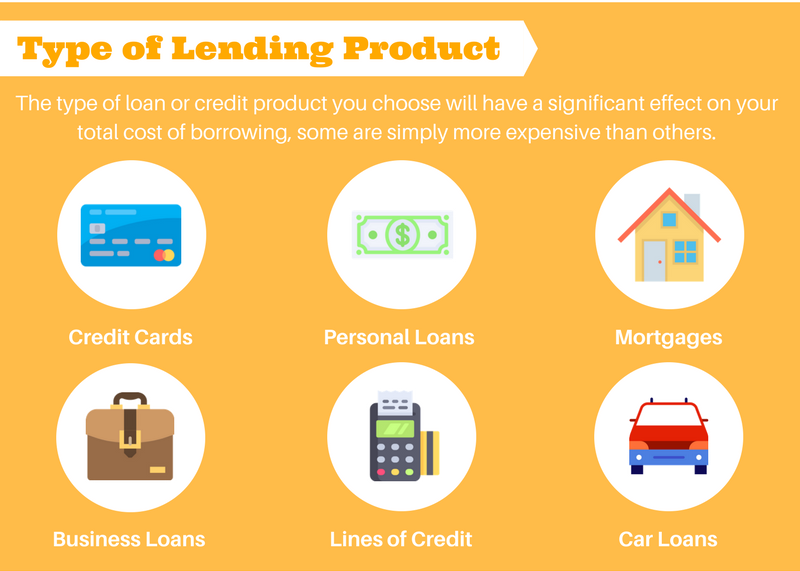 But what many borrowers don’t realize is that all components of their lending product directly affect how much it will end up costing them. Let’s take a look at the five main factors that affect just how much borrowing costs. This goes without saying, the type of loan, credit card, or line of credit you choose will greatly affect your total cost of borrowing. Obviously, if want to purchase a house you’ll need to take out a mortgage, and if you’re looking for a short-term financial solution you might turn to a credit card, personal loan, or line of credit. Certain situations in your life will require specific loans, this means you won’t have much of a say. But what you do have a say in is just how much you’ll end up spending to borrow the money you need. The amount you decided to borrow obviously has a huge impact on your final cost of borrowing, the more you borrow the more you’ll need to pay back goes without saying. But what many borrowers don’t take into consideration is how the amount they decide to borrow can affect all other aspects of their loan. 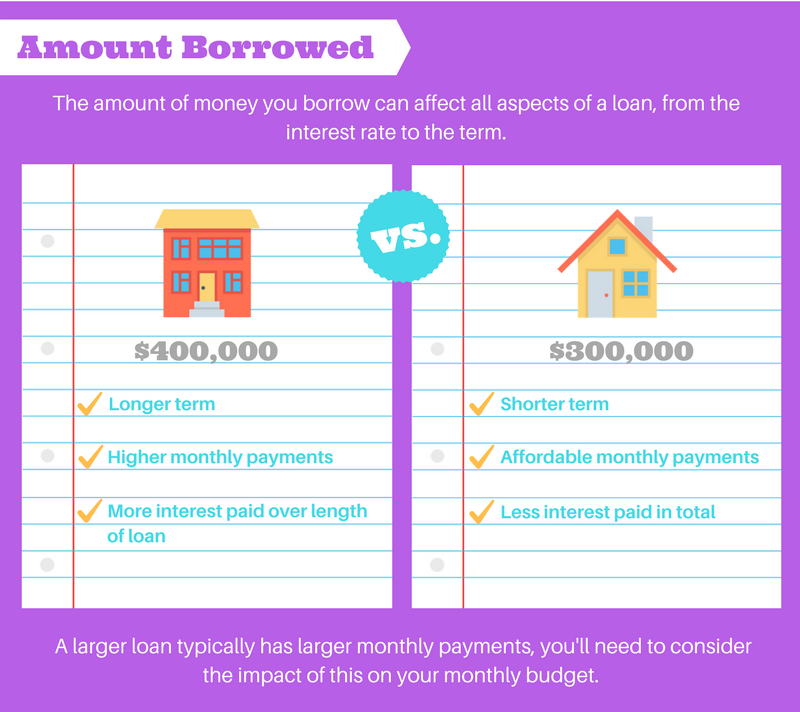 The interest rate, term, and fees are all impacted by the amount borrowed. Borrowing more than you can realistically afford to pay back simply because a bank or lender offers it to you, is the ultimate recipe for out of control debt. Before you decide to accept a loan offer or even before you decide to apply for a loan, you need to carefully consider the amount you’re going to borrow and how it will affect your life and the lifestyle that you wish to have. 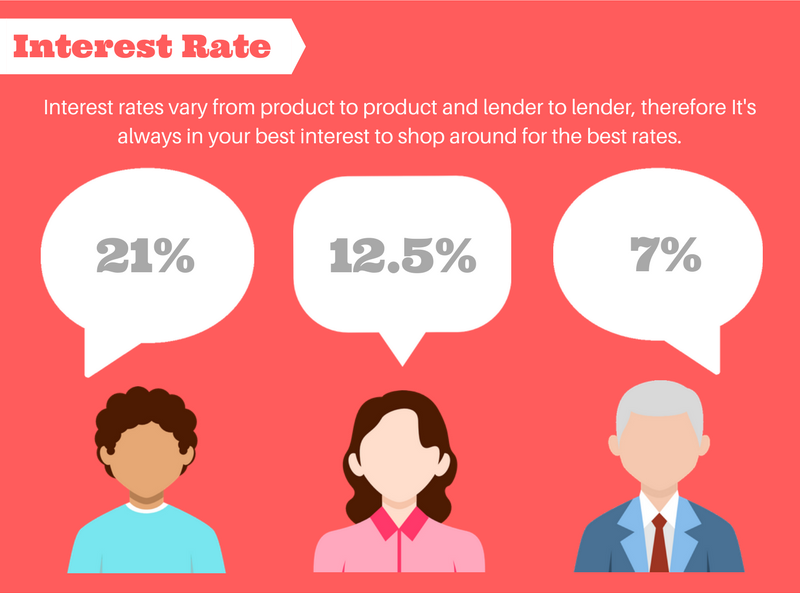 Most lending products come with their own range of interest rates. Credit cards almost always have an interest rate around 20% and currently, in Canada, a mortgage from a major financial institution will have a rate of less than 4%. Please keep in mind that these two examples are generalizations as there are credit cards and mortgages with both significantly higher and lower rates. Hopefully, you get the point though, you’re not going to find a credit card with an interest rate of 3%. When comparing the cost of borrowing, it’s important that you not only look at the interest rate but also the annual percentage rate (APR). The APR of a loan is the interest rate plus the cost of any fees averaged out over the length of the loan. It’s a great way to determine which loan is not only the least expensive but the best match for you. A lower APR means that your monthly payments will be lower and therefore more affordable. Check out our article all about interest rates, here. When you borrow money, you are given an interest rate that is either fixed or variable, it’s important to understand how both of these options will affect the overall cost of your loan so that you can make an informed decision about how much you can afford to borrow. When your lending product has a fixed interest rate it means that you’ll be given a rate that will remain the same for the duration of your loan. This also means that your monthly payments will always be the same which in turn means that you’ll always know what to expect and be able to organize your budget accordingly. Many people choose a fixed rate over a variable rate because it is predictable and stable. On the other hand, when the money you borrow comes with a variable rate, it means that your interest rate fluctuates with the benchmark/ overnight interest rate (the interest rate at which banks lend and borrow among themselves). If the overnight interest rate increases, so will your variable interest rate. To start out, variable interest rates are typically lower than fixed rates, this is often why consumers choose to go with a variable rate. But, should the overnight rate increase, so will your rate which means your monthly payments will become more expensive and potentially harder to maintain. A variable interest rate is hard to predict and therefore less stable than a fixed rate. 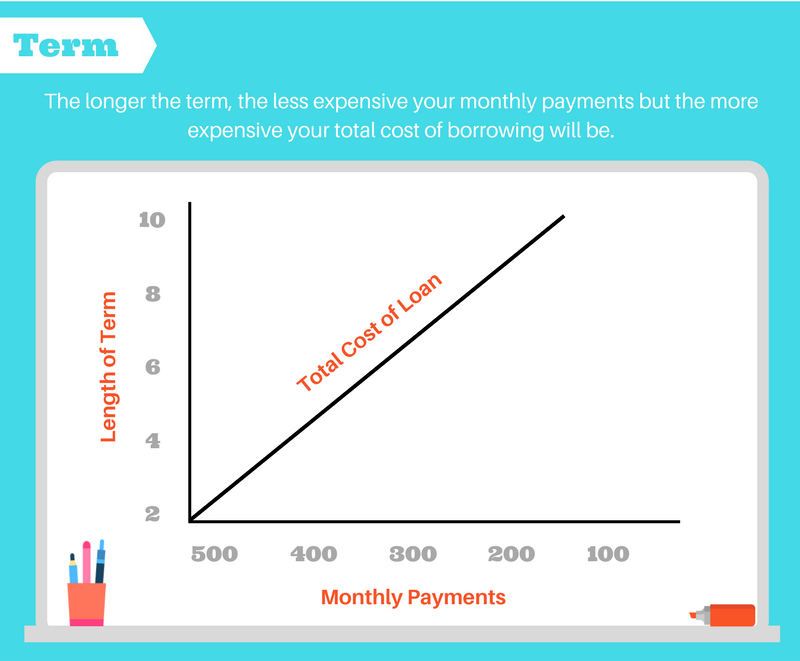 A loan term is the period of time in which you must pay back the money you’ve borrowed plus interest and fees. Loans with longer terms typically have smaller monthly payments, so if cash flow is important to you, a longer term may be beneficial. But, it’s important to keep in mind that a longer loan term also means that you’ll be paying more in interest over the life of your loan. Confusingly enough, when it comes to mortgages, a term is not the time it takes to pay it off in full. A mortgage term is the length of time the mortgage contract is in effect for, typically 5 years although a mortgage term can be anywhere from 6 months to 10 years (for a more in-depth look at mortgage terms and amortization, click here). When you first sign your mortgage contract you’ll agree to adhere to the parameters of the mortgage for a predetermined amount of time, this is the term. Once the term is up you’ll meet with your lender to renew your mortgage and start a new term. 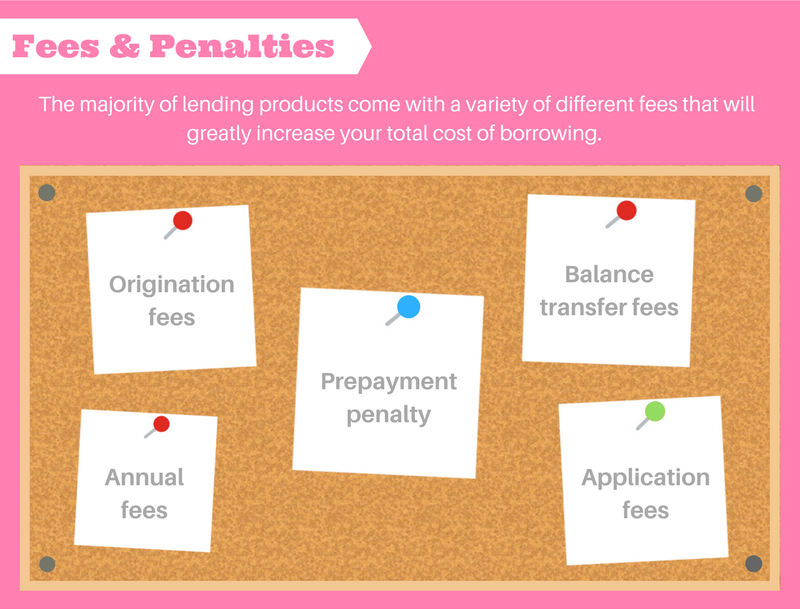 It’s safe to say that the majority of lending products come with fees and penalties, all of which can greatly increase your total cost of borrowing. While there are many fees that simply cannot be avoided, for example, the origination fee for a mortgage, some fees and definitely all penalties can be avoided. This is why it’s so important that you fully understand all aspect of the product you’re interested in before you sign a contract. Sneaky fine print and less than honest lenders are more common than you think and could end up increasing your cost of borrowing by a significant amount and thus take your loan from affordable to unreasonable very quickly. Borrowing will always cost money, there really isn’t a way around it. But the good news is that you are in full control of your money and what you do with it. Taking care of your financial health and managing your finances responsibly should always be a top priority of yours. Once you’re able to maintain a stable financial life, borrowing becomes easier and more often than not more affordable.